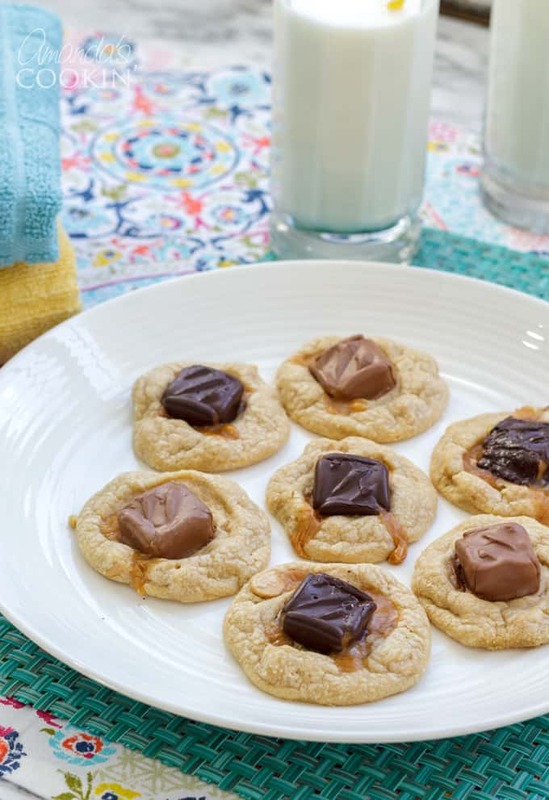 I’m a peanut butter cookie fan for sure, but adding candy bars into the mix is a real bonus. During cookie making season (AKA the holidays) I always try to get a batch of these delicious candy bar cookies into the mix. 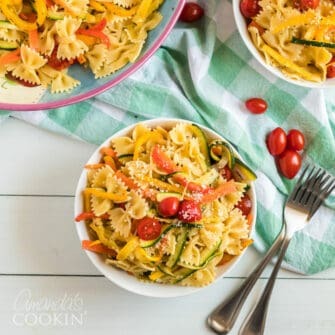 They are always a hit and can be made and devoured any time of the year! Almost a decade ago I found Cherie’s Snicker Peanut Butter Cookies on my blogging friend Barbara’s blog. 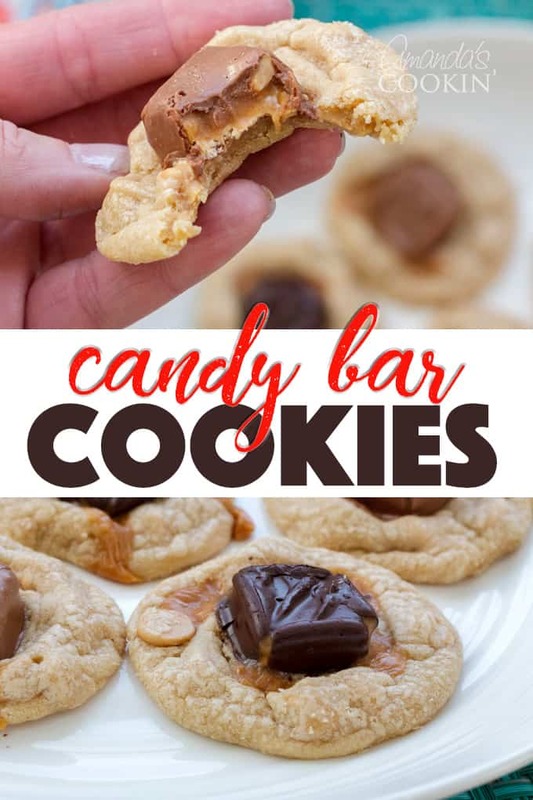 While I am topping these cookies with candy bars in the same fashion that she did, there are several ways to incorporate the candy bars into these cookies. Place the dough balls on your cookie sheet and press a mini candy bar into the ball and bake. This is how my recipe reads below. Chop the candy bars into pieces and add it to the dough, roll into balls, flatten with fork and bake. Roll into balls, flatten pretty thin and wrap the dough around a whole Snickers mini and bake. If you have mini muffin pans, you can fill it with dough balls and press a mini candy bar into it and bake. 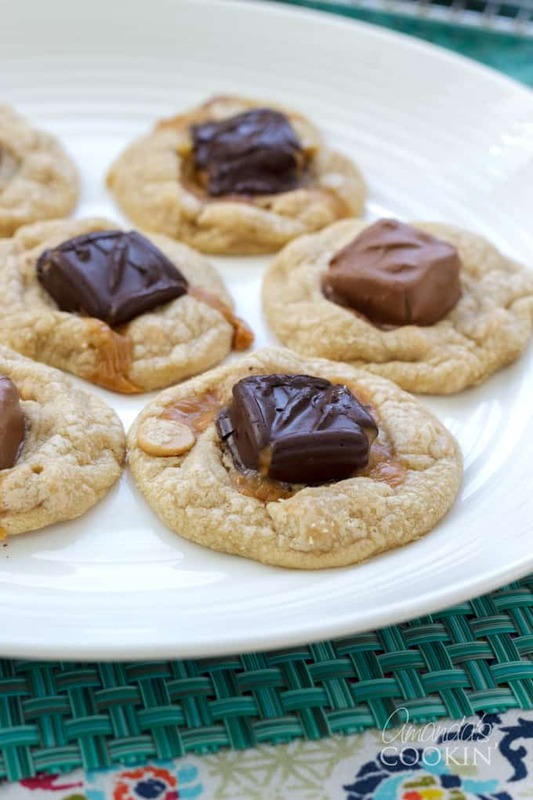 There are peanut butter chips in this recipe as well. They do make the cookies a little sweeter than they may have been otherwise. You can substitute chocolate chips if you prefer, or just leave them out altogether. I’ve experimented with quite a few peanut butter cookie recipes. I’ve made Nutella Peanut Butter Cookies, Chocolate Filled Peanut Butter Cookies, Chocolate Peanut Butter Cookies (one of my faves! ), and even Peanut Butter Oatmeal Chocolate Chip Cookies! Or, for a fun twist using peanut butter, I’ve even made my own homemade candy bars using graham crackers, peanut butter, and chocolate. SO good and SO easy! Then there’s these huge and colorful Monster Cookies and my Peanut Butter Chocolate Chunk Bars, and of course the classic Peanut Butter Cookies. I love having a big arsenal of peanut butter cookie varieties. If you know of one I should try, please leave a comment below! I have been looking for this recipe for years…a friend of mine always made these and my sad attempt to duplicate a few years ago didnt pan out. Im going to add these to my christmas cookie list! Thanks!! These looked so good on Barbara's blog and they look just as yummy here! 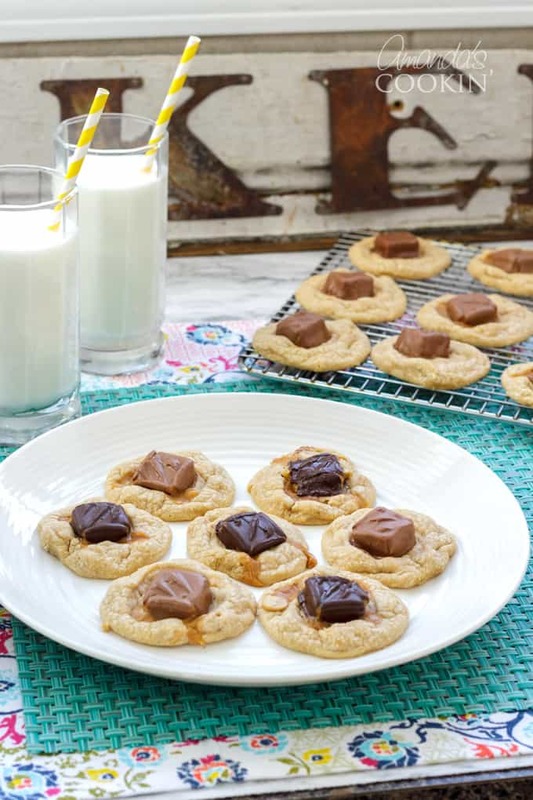 Cookies + candy bars = bliss! 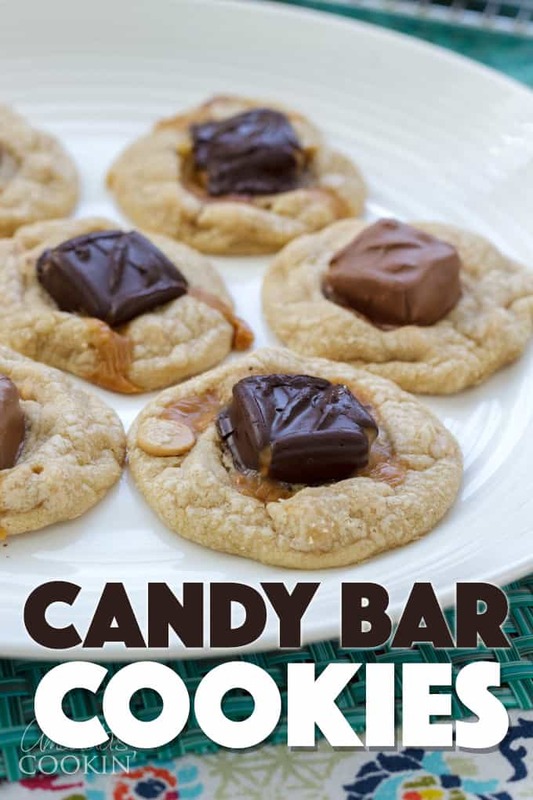 i never make cookies/bars like this with candy bars on top or inside, but i always get excited by the idea! So does this make a whole ton of cookies? I mean, a whole bag of peanut butter chips, a whole bag of mini-Snickerses… I'm definitely going to make them, I just want to know whether to cut the recipe down or what. Seriously, these look ah-may-zing. They need to take up residence in my mouth. 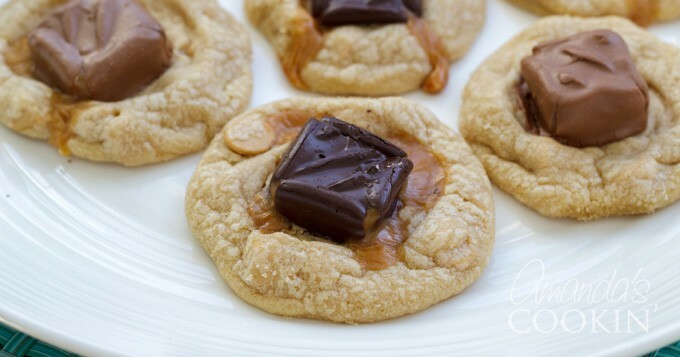 My boyfriend LOVES snickers so I will definitely be making these soon. They look delicious! Oh my, these look amazing! Definitely giving them a try this week! Oh Amanda I know these are good! I have made them with the snickers inside but not on top. I think they look so pretty and I can't wait to try them. They will look perfect on my Christmas cookie platter! Just yesterday I made brownies loaded with chopped snickers bars and topped with homemade caramel sauce. Great minds, Amanda! Your cookies look super good. 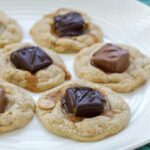 I think warm, melty gooey candy bars baked into cookies and such much better! 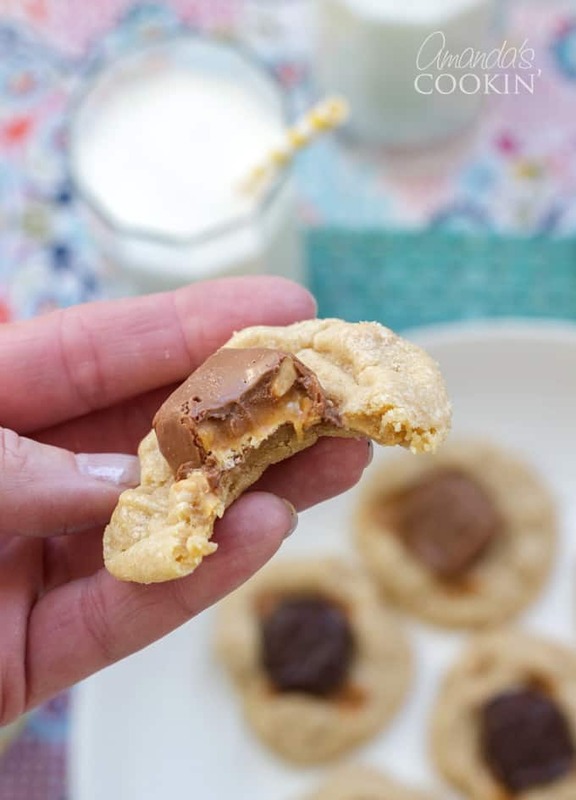 I love cookies with candy in them and I can picture these with miniature reeces cups…YUM! Barbara said: "Sorry you had to eat those broken ones!" Your cookies look perfect! Thanks for the additional tips! I updated my post to include your tips. Sorry you had to eat those broken ones! Oh I saw these on Barbara's site too and almost died! Peanut butter cookies are my favorite, and Snickers are my favorite candy bar. Can it get any better than this!!? ?